George Graham Reviews Norah Jones' "Not Too Late"
In the pop music world, there are artists who are the critics' favorites and there are the hitmakers, and usually they don't overlap. Once in a while, due to some freak of nature, a worthwhile and creative artist will have a hit and suddenly become popular. Then there arises the dilemma: will that artist succumb to the pressure to make a follow-up recording that is dumbed down supposedly to reach the masses, what we used to call "selling out," or will that artist continue down the individual path that set him or her or the band apart in the first place. Unfortunately, more often than not, it's the former, i.e. selling out, making more so-called radio friendly music. But this week, we have an artist who is a happy exception to the rule. 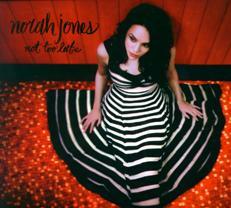 Norah Jones is out with her third full-fledged CD, called Not Too Late. Norah Jones, who grew up in Texas and graduated from the jazz program at North Texas State University, is also the daughter of Indian sitar virtuoso Ravi Shankar. She became a phenomenon in 2002 at the age of 23 after the release of her album Come Away with Me. When it came out, we featured it here on this series and noted her appeal as a distinctive jazz and folk influenced chanteuse. Despite the best efforts of the commercial media to keep her music a closely held secret, her CD went platinum, and won a fistful of Grammy Awards. But rather than turn into a pop diva, and water her music down, she went on her merry way and was involved with an fun side project of old cover songs called The Little Willies, with some of her musical colleagues on her CD, and in 2004 released Feels Like Home, which had her moving more into the realm of the singer-songwriter. Now she is out with Not Too Late and it may be her best recording to date. She is further maturing as a songwriter, and this time around, makes some comments on the state of the world. Every song on Not Too Late was either written or co-written by Ms. Jones, while many of the songs on her debut were the work of others. She also expands her stylistic range, and does not try to create a sequel to her hit Don't Know Why. Once again, her country music roots show with some steel-guitar and country-style waltzes, but she keeps her easy jazz-influenced laid-back style that gave her such appeal. She works with some many of the same people who were on her previous recordings, including bassist Lee Alexander, guitarist Jesse Harris, who wrote Don't Know Why on her first album, and drummer Andrew Borger. Notably absent from this recording is producer Arif Mardin, who handled Ms. Jones first two CD. The veteran producing legend passed away last year. So bassist Alexander served as producer. If anything, this is a more laid-back album than her previous recordings, and is somewhat more guitar-oriented -- Ms. Jones plays guitar as much as she does her trademark piano. The sound is decidedly acoustic, with acoustic bass throughout, and some light electric guitars and keyboards scattered about. There are also some cellos, including Jeffrey Zeigler of the Kronos Quartet. Ms. Jones' vocals are just wonderful. Once again, she resisted the temptation to build on the quirks and idiosyncrasies of her vocal style, as one might expect a hit artist to do, and instead seems almost to melt into the music with impressive control and a lot of subtlety. The songs taken together lyrically, seem to have a more downbeat direction. A couple of the political songs lament the state of the world and the people running it, but there are also some love songs, divided between regretting lost love and celebrating its presence. Norah Jones' new CD Not Too Late, her third formal recording under her own name, is I think, her best yet. The young chanteuse, who appeared in 2002 with a delightful album of mostly other people's songs, has developed into a first-class songwriter, spanning topics from love to politics. As a performer -- and she is still only in her mid 20s -- she has become more mature, tasteful, subtle, and in some ways, more unassuming. Her vocals sound wonderfully relaxed throughout the album, and most thankfully, she does not try to pander in any way to the market. With that in mind, it will be interesting to see how the commercial media deals with such a laid-back and intimate recording, one that avoids all the cliches and in fact, does not even try to sound like the Norah Jones of Come Away with Me. Sonically, the album gets a solid grade "A" from me. The recording captures the intimacy of the music and very much enhances its laid-back feeling. It is also significant in that for a major-label recording, it has considerably less volume compression than is typical in these days of super-pumped-up CDs. So the music can actually get soft at times. Norah Jones has definitely not let stardom go to her head musically. She makes no artistic compromises on Not Too Late, and has grown into an even more impressive artist.